Is the storied bromance between Canada’s Andre De Grasse and Usain Bolt over? Judging by the Jamaican sprint superstar’s comments ahead of this week’s track and field world championships, it would seem so. Bolt, the nine-time Olympic champion who will run his final 100-metre race on Saturday, was asked who might fill his shoes after he retires. It is almost certainly a reference to De Grasse, the 22-year-old up-and-comer who brazenly pushed Bolt last year in the Olympic 200 semifinals, eliciting a finger-wag from the greatest sprinter in history. 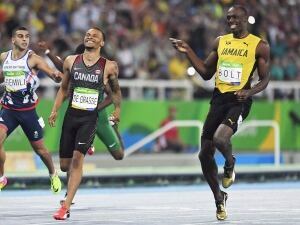 And then two weeks ago, De Grasse’s coach, Stuart McMillan, told CBC Sports that Bolt denied De Grasse entry into the 100 field at a Diamond League meet, a charge Bolt and his team denied. If there’s going to be drama in Saturday’s 100 final, De Grasse is the best bet to provide it. But Bolt doesn’t see that as a problem. “You guys know if I show up at a championship, you know I’m fully confident and ready to go,” he said. As for the possibility he’d change his mind about retirement should he lose in Saturday night’s 100-metre final: “It’s not going to happen, so we won’t have that problem. Don’t worry,” he said in an hour-long chat with reporters. Sporting the goatee he wears during world championships, but not the Olympics, the superstar who went 9-for-9 at the Summer Games, shattering records while dancing and smiling his way through the journey, dispensed any notion he might come back: “For me, the next championships should be fun because now it’s time to watch and see who can hold their nerves,” said the 11-time world champion, who turns 31 on Aug. 21. He said he’s looking forward to a life of motivational speaking, occasional soccer games with friends and maybe dipping his toe into action movies to keep the adrenaline flowing. 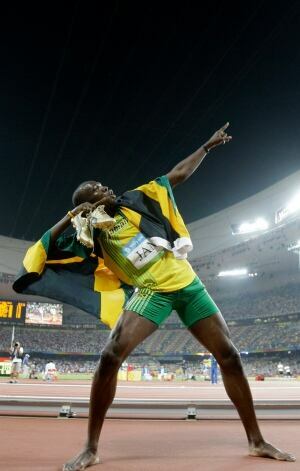 As for the past, one of Bolt’s most interesting revelations was that his now-famous “To the World” pose, which he debuted after winning his first Olympic gold medal in Beijing, was completely unplanned. Almost every celebration since — the moderator said Bolt has taken 147 victory laps over his career — has been pre-planned, drenched in Jamaican flags and reggae music and every bit worth the wait. Among the few impromptu moments came at the last world championships, two years ago in Beijing, when a photographer riding a Segway accidentally upended him during his victory lap. On a more serious note, he was asked how he has prepared for each season as his career has progressed. Like flipping through the calendar, Bolt ticked off his goals and motivations for each year since he burst onto the scene in 2008, a relative unknown whose only goal was to become an Olympic champion in his main race, the 200 metres. Early on, he took umbrage to the slights: for instance, that despite setting four world records, his success in 2008 came because his main challenger, Tyson Gay, was hurt. Or how in 2012, many were favouring teammate Yohan Blake at the Olympics after Bolt lost to him twice earlier in the summer in Jamaica. As the calendar kept turning and Bolt kept proving himself, his mission became more about trying to secure his place in history. When he swept gold for the third straight Olympics last year in Rio de Janeiro, he reached the legendary status he sought. He fielded the obligatory questions about doping. Bolt has never been caught. Many in his country, and in the sprint game he dominates, have. The last two years have been filled with sordid stories of doping corruption in Russia that brought track and field to a new low. He unveiled the gold-and-purple shoes he’ll wear for his final championships. The purple is for his school colors back home at William Knibb Memorial High School. The gold is self-explanatory. His sponsor, Puma, has been promoting the phrase “Fastest Forever,” in the lead-up to the worlds, which will take place in the same London stadium where Bolt won Olympic medals 4, 5 and 6. But Bolt has a different idea.